“We pray on the street corner, hold hands and then knock on doors. We’re out of our Catholic comfort zone.” That’s how Carol Goldsmith describes the efforts of St. Jude Church parishioners who have joined with other churches, businesses and civic leaders in trying to reach out to residents of the Gardere Lane area in Baton Rouge. St. Jude is a stockholder in the Gardere Initiative, an organization that strives to address drug abuse and other issues in the once crime ridden area, which lies just south of the church. The latest effort of that group is to open a free library, office and education center, where Gardere residents can come for tutoring, have access to computers, nutrition programs, parenting classes, prayer and Bible study. The office, a converted apartment located on Ned Avenue, was formally dedicated Jan. 25 after the group received a grant from the South Burbank Crime District to help pay rent and make improvements to the building. Some of the rent was diverted with sweat equity after volunteers made repairs to the apartment. The Gardere Lane area, particularly the west side south of Burbank, has been notorious as a high crime area and a haven for drug dealers. “The drug dealers feel like they can come out here and they do,” Goldsmith said. But she added the sheriff’s office has been active in the community and quickly solves many crimes there. And, Brown added, “No matter what happens, we are here to stay.” Both Brown and Goldsmith said the area has been steadily improving. In its first week of operation, the center already was helping residents of the area prepare for the HiSet, a high school equivalency test, and holding cooking demonstrations, using the vegetables grown in a community garden in the nearby Hartley-Vey BREC park. A free library set up in front of the apartment offers residents from elementary school age to adult an opportunity to read. 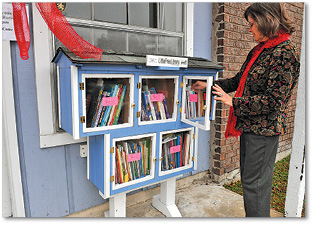 Part of a nationwide program known as “Little Free Libraries,” the local program makes books available free of charge. Basically you take a book and put one back in, Brown said, of the homemade structure which houses the donated books. On Jan. 21, Martin Luther King Day, more than 500 books were distributed. The apartment is equipped with computers to give Internet access to nearby residents. Tutors from St. Jude and other churches will be available to help students after school and intercessory prayer will be held on Thursdays. Goldsmith credited Gardere Initiative member Murelle Harrison and its president Caulette Jackson with being instrumental in getting the new office set up and in being creative in bringing services to the area. In the meantime, parishion­ers of St. Jude plan to roll up their sleeves, knock on doors and let the people know what services are available.